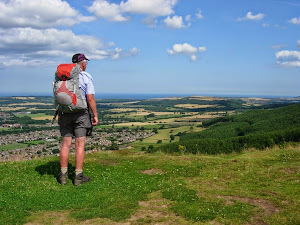 On Wednesday, Bryn and I drive to Sutton Bank, North Yorkshire, where, on the following day, we set off on our six day walk along The Cleveland Way to Scarborough; a walk of about 90 miles. Our planned overnight stops are: on arrival at Sutton Bank, then Osmotherley, a wild camp somewhere in the Cleveland Hills south of Kildale, Saltburn, Runswick Bay, Robin Hood’s Bay and Scarborough. We’ll be camping out each night except the first at Sutton Bank, the last at Scarborough and in between at Saltburn-by-the-Sea where B&Bs have been booked. I should feel as if I am almost at the end of the road on a journey that began in March to prepare body and kit, and the end of the road being Scarborough where, when we arrive, Bryn and I will have achieved our aim of walking part of The Cleveland Way. For both of us though, it’s the true start of a longer journey - a return to backpacking and a future with all its rewards. We’re hoping for fair weather on this trip but prepared, we think, for the worst. We’ll be looking for some decent food (Fish and chips in Whitby and Scarborough of course) and the odd drink (pubs are a bit thin on the ground before the coast but there’s more than enough from Saltburn onwards). You should be able to read about our trek here. Good luck with it Brian. It seems to me that you will be fine. Remember to eat and sleep well and most importantly. Look After Your Feet! Any hit of a hot spot: Stop and rub a bit of vaseline into it, dry your feet in the air then start again. If anyone notices an elderly bloke on the North York Moors airing his unclad white feet then don't fret, it'll only be me resting a while.